Today I got a lovely e-mail from eestiblogid.ee. 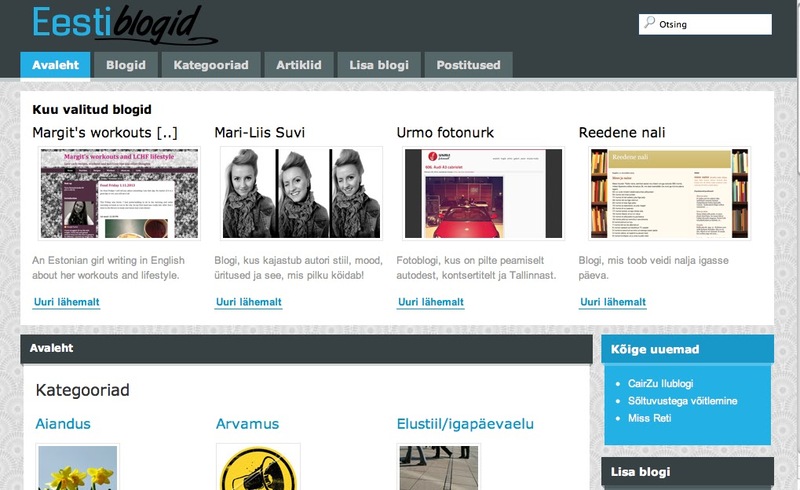 It’s a website that collects together all Estonian blogs from all different categories. Every month they bring out 4 blogs on their main page that they think are especially interesting and worth sharing. Iga kuu toome me eraldi välja neli uut blogi, mis meie arvates on eriti põnevad ning esitleme neid oma veebisaidi avalehel. Teie blogi on valitud blogide seas detsembris 2013. I’m actually so happy right now. I feel it’s my mission to spread the word about LCHF and low carb lifestyles in general and also emphasize the importance of workouts. I’m all about promoting healthy and sustainable lifestyle and getting featured on the main page of eestiblogid.ee helps me do that even more. It’s not a huge step but it’s something really special to me. Now I have a chance to send them one blog of who should be on the main page next month in my spot. I’m going to have to think really hard and decide on one blog but there are so many good ones that deserve the spotlight.